The gold theme continues here at NintendoFigures with a review of one of Micro Land’s latest releases. I haven’t seen any reviews of this product yet and I’m excited to share my thoughts. Background – Repainted figures can be unpopular with collectors depending on how well they are pulled off. Taking a figure a company already released and slapping a new paint job on it can be seen a cash grab, but with how rare some of the older Mario figures are and the fact that the gold paint looks great, I think many fans of Micro Land will be happy to buy these figures. No matter how you feel about New Super Mario Bros. 2, it is hard not to be excited that Jakks Pacific is releasing figures from such a specific game in the Mario series. Some people might prefer other Mario games, but at least Jakks chose a distinct theme and covered it well with these new figures. I can’t think of anything else that is specific to New Super Mario Bros. 2 except for the Gold Block that Jakks Pacific hasn’t made. As a result, I think it is fair to assume that these are the only releases from New Super Mario Bros. 2 we will get. Let’s take a look at each of the figure packs and see how they turned out. 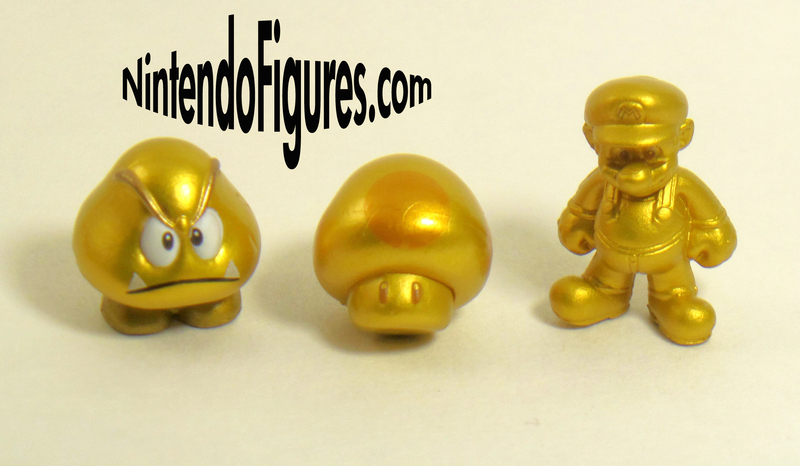 Gold Mario/Goomba/Gold Mushroom Pack – While this is true of all of the figures, the gold paint on these figures is outstanding. To be honest, it looks better than the Gold Mario Amiibo which is generally higher quality than Micro Land. Of the three packs, this one seems essential if you want to build your own New Super Mario Bros. 2 level, because you get core characters like Mario. As with previous Mario figures, Jakks really puts a lot of effort into making Mario look good and Gold Mario has the same great detail and texture in his clothes and hat. A Goomba is another character you can’t go wrong with for any Mario level and to get him in gold is pretty neat. The paint and details look great on mine. Where this figure does suffer is on the left and right side, you can see where the plastic was removed and it almost looks like dimples. This type of damage is disappointing though not uncommon with Micro Land. 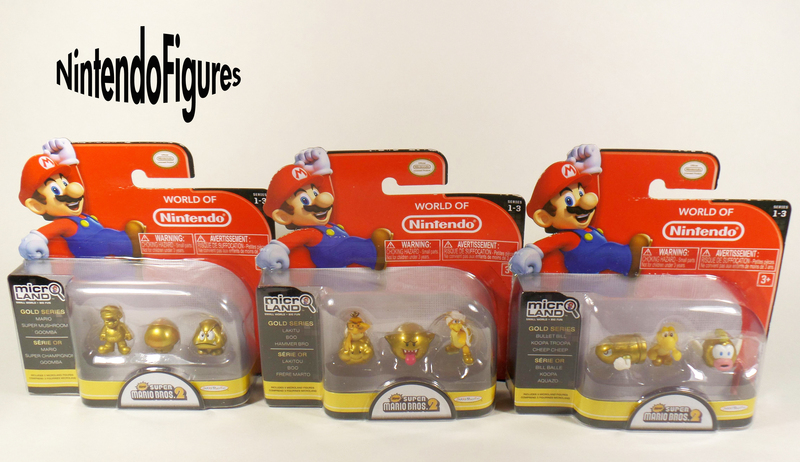 The last figure is the Gold Mushroom which is actually awesome to get. In my review of Acorn Plains, I talked about the Power-Ups being a weakness of that set and Jakks has given us a real plastic Power-Up that you can use and display with the many block tiles that have been released. Mine has a seam that runs horizontally across the top of the mushroom which is noticeable and disappointing. However, I’m excited to have an actual plastic Power-Up and will gladly pay to get more Power-Ups in the future (a Fire Flower would fantastic for example)! Koopa Troopa/Bullet Bill/Cheep-Cheep Pack – If I had to pick a least favorite pack, it would probably be this one though that does not mean this pack doesn’t have some real upsides either. Koopa Troopa, like a Goomba, is a staple of Mario games and it is the most impressive figure of the three. I love this figure’s pose and paint job. He looks cute and has a relatively cheerful look to him. The back side looks amazing with his gold shell too. I’m very happy with how this figure came out and it is one of my favorites in this series. Bullet Bill looks fierce in Gold. Jakks got his pose and details right as well. While he does have the factory code written on the bottom, Jakks has tried to hide it better than they did in earlier figures which is much appreciated. Bullet Bill is a nice figure and well worth having even if he would look even better with a clear plastic stand. Cheep-Cheep is probably the oddest figure in this series. I don’t remember Gold Cheep-Cheeps and they are a relatively uncommon enemy in Mario since they only appear in water levels. However, Cheep-Cheep looks good in gold and is a welcome addition. My figure has some paint imperfections, mostly where the lighter white and yellow paint are. I doubt many people would be pumped to get this figure, but it can’t hurt to have another of Bowser’s minions, especially if you have some water tiles you can use Cheep-Cheep with. Lakitu/Hammer Bro./Boo Pack – If you’re looking for the pack with the best looking figures, I would recommend this one. Lakitu is one of my favorite and most feared Mario villains and I think he looks great in gold. The paint job here is better than the regular one in 1-2 and areas like his glasses which are not always well done, look very good here. The pose is the exact same which is disappointing, but since these are repaints, it is not too surprising. 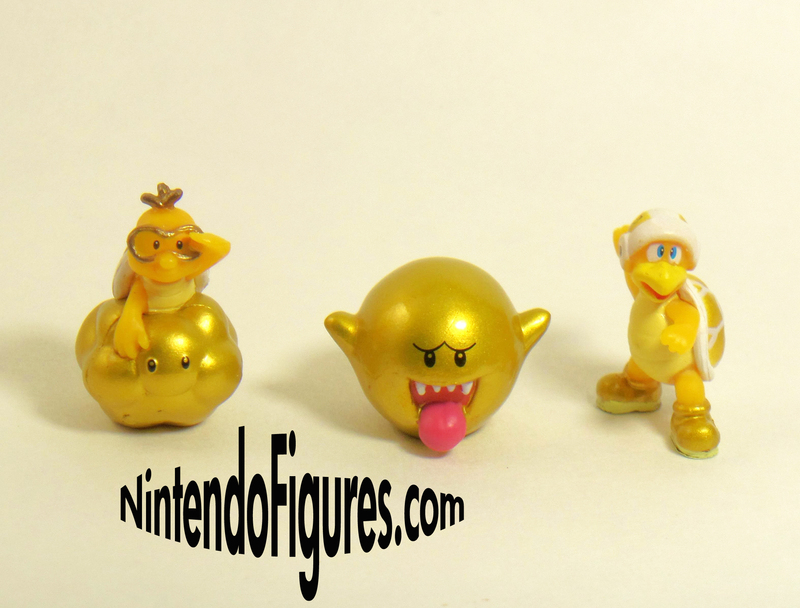 Boo is also the exact same as in 1-2, but he looks incredible in gold. I’m not sure if Gold Boos appeared in New Super Mario Bros. 2, it seems unlikely since they can only be killed with a Star and the Gold form gives extra coins, but that doesn’t make me enjoy the figure any less. In fact, I like this Boo so well, it makes me want to get some Luigi’s Mansion tiles to use with it. The best paint job out of any of these figures is definitely the Hammer Bro. Mine has excellent details like on his helmet, the gold boots and his shell. One of the hardest Mario enemies has never looked so good! In addition to the paint job, he also has a great pose and looks like he is ready to hurl a hammer right at Mario. The Hammer Bro. will look fantastic in any level you build. Thoughts on this series – As I suggested in my comments on the individual figure packs, the quality of paint and the application is higher here than in some of the previously released figures. The biggest complaint is that Jakks needs to come up with a better way to remove the figures from the plastic molds. My Goomba and Boo both have obvious damage where the figure was removed from the mold which is always going to scare collectors away from this series. When you put the figures together though, they look fantastic and I had fun making a little scene for this review. While the figures don’t work perfectly as far as theme goes with the existing New Super Mario Bros. U tiles, Jakks has still shown what they can look like on the back of the package. Personally, I would love to see some Bowser’s Castle or underground levels to use these with. The more generic of a Mario tile set Jakks releases, the better it will work with this series. I’m encouraged to see that Micro Land is becoming higher quality as time goes on and that Jakks is giving us unique figures we can’t get anywhere else. I am not a huge fan of New Super Mario Bros. 2 because it is a little too easy and a little bland, but getting gold figures which was the coolest part of the game is perfect for me as a Mario fan. If owning gold figures appeals to you at all, I definitely recommend checking out these figures. I’m happy with my purchase and will certainly use them in displays in the near future. Next World of Nintendo Micro Land Zelda: Wind Waker Figure Packs Revealed!